Mixing boards are covered with oodles of small knobs and fader switches, all of which are easy to break off if you even look at them funny. Once broken off, it is usually not easy to find direct replacements (in a timely manner), and it usually takes plenty of labor to disassemble the mixer and replace the parts, if it is even possible. 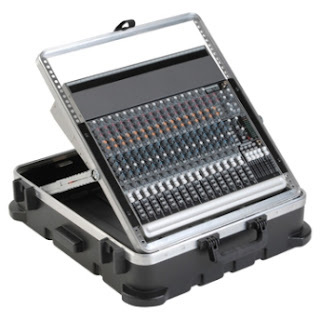 It is better to protect your mixer in the first place, which is why I really appreciate products like the SMB 1SKB-P12 Mixer case. SKB has been around since 1977, and they make molded polymer cases for most everything you can think of, from sporting goods to military applications to musical equipment. 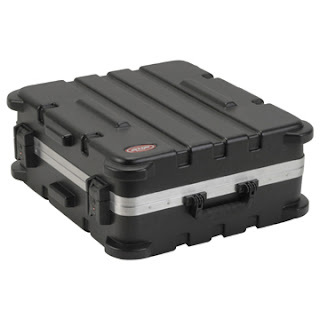 Many manufacturers (such as Fender and MusicMan) provided SKB-sourced cases for their instruments. SMB has tremendous customer support and offers a lifetime warranty on many of their products. 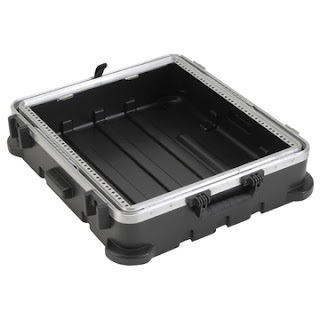 I got this 1SKB-P12 case to use with my Yamaha MC166CX mixing board, which is just about a direct fit for this unit. SMB specs this as a 12-space rack, and Yamaha says their mixer is 12 spaces tall. Somebody is wrong (Yamaha, it turns out), because after I installed it there was one space left at the top, which is fine because I can install a pre-amplifier or power conditioner in that spot. It is the standard rack width (19 inches) and it can handle mixing boards that are up to 5 inches deep. The case it made of molded polyethylene (in fashionable black), and is pretty big on the outside. It measures 27 x 24 x 10 inches, and weighs a little over 16 pounds when it is empty. It has two latches with built-in TSA-approved locks, should you happen to feel comfortable turning your mixing board over to the baggage handlers (I cannot imagine a situation where I would actually need to lock it). 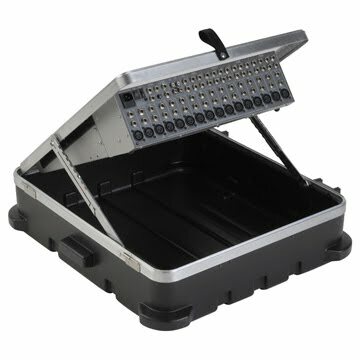 The hinges on the opposite side of the case are designed so that the lid can be easily removed during performances. Oh, and there is a fairly comfortable handle provided too. The best part of the case is that rack is mounted to a ratcheting mechanism, so it can be tilted up for easier viewing and reachability. The ratchet provides plenty of stops so you can find an angle that is best for you, and to return it to flat again, just pull the rack up to its highest angle and the ratchets will release and allow it to fold down. Looking at the case, there is no way I am going to be able to break this thing, in fact it meets meets ATA 300 Category 1 specifications. This means it should be good for a minimum of 100 common carrier trips. And after using the case a few times I have no gripes. The ratchets and hardware are up to the task, and the material they made the case from is super tough. Plus I am able to fit a few extra microphone cables and my usual paperwork into the case, which makes my other road cases not quite as over-packed as they normally would be. I think it is a winner. The 1SKB-P12 is a fantastic case, and it delivers everything that is promised, but man oh man it is expensive. It has a list price of $405, and a street price of $269 which is a lot of cash but it is worth it to protect your investment, not to mention getting all of your gear to the gig in one piece.